Sometimes I feel that since I’ve left school my brain has gone soft. That’s why I love documentaries and historical dramas; I’m able to be entertained and learn something at the same time. When I started this blog I wanted to try and write about topics that would do the same thing, entertain and educate. I hope at some point reading my blog you’ve said “That’s interesting, I didn’t know that.” With that in mind, I decided to refresh our memories on some of the subjects we learned in elementary school. We all learned it, but most of us (myself included) don’t remember it. First up: The British Monarchy. I’ll start with King Henry 8th. He’s the King who left the Catholic church so he could divorce his 1st wife Catherine of Aragon, for Anne Boleyn. Anne Boleyn was played by Natalie Portman is the Other Boleyn Girl. Henry had one son who succeeded him but he died five years after his father. That’s when Queen Mary 1st became the first female ruler. She was the daughter of Henry 8 and his first wife. This is where the movie Elizabeth (starring Kate Blanchet) picks up. As you remember in the beginning the of the movie, old and ugly Queen Mary is trying to get pregnant. She arrests Elizabeth and so on and so on. Again, health was an issue and Mary dies 5 years into her reign. Elizabeth becomes queen even though her cousin Mary Queen of Scotts also had a claim to the throne. MQS never gets to the throne but when Elizabeth dies her son James does. There are no movies about him (that I know of) but he was responsible for a new translation of the bible. [the King James Bible]. Fast forward through centuries to King George 3rd the subject of the Madness of King George and responsible for loosing the American Revolution. 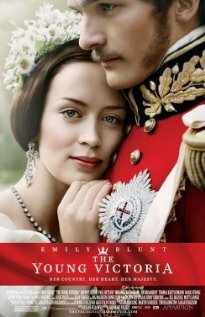 His granddaughter was Queen Victoria played by Emily Blunt who became queen at the age of 18 and became the longest ruling monarch in British history. So there you have it. Now you’ve gotten a little refresher course in British history and you’ll score if there is ever a category on Jeopardy. ***Look for the next refresher course: the US Government. Coming Soon.